Birding Is Fun! : Starting a new "Life List"
It seems that when I go out into the field on a single-minded quest for a target bird, more often than not I am disappointed. For the past couple of weeks, I have wanted to see a warbler. Any old warbler would do. Until I took up photography a few years ago, "see" meant exactly that. More correctly it meant "see and identify." I must admit that by "see," I now mean "photograph." 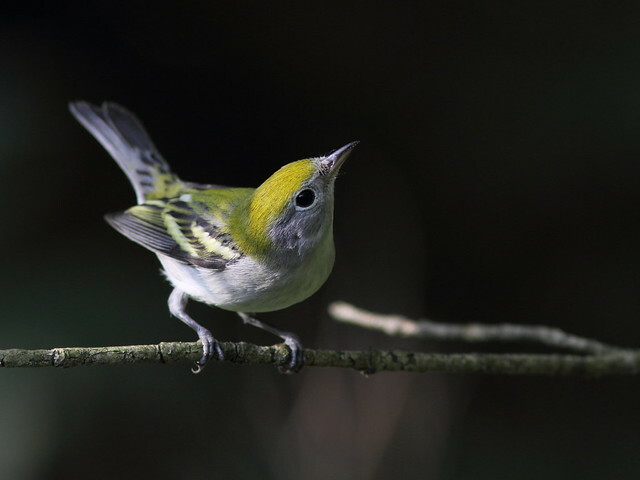 In the case of migrating warblers in the fall, this sharply narrows down the criteria, even with the help of 10X glasses and a supple neck. Trees are full of leaves and warblers prefer to be high up and on the wrong side of both. Now I have a stiff neck and my cataractous eyes force me to depend upon automatic focus if I want a clear picture. Why do I now have this compulsion to package birds' images into files that consist of nothing but ones and zeroes? The world does not need any more bird photos. Birds must be the most photographed natural objects other than babies and waterfalls. If I want to see a great bird picture I can just Google for it. It should be enough for me to simply take in the great beauty of plumage, song and movement. And it always was, until a 300 millimeter image stabilized lens attached to a 1.4x extender and a progression of three generations of digital single-lens reflex cameras with a monopod and accessory pack were added to the weight I carry into the field. Why do I wish I were carrying this burden when an eagle flies over as I am walking to the supermarket? It is just another eagle, and pretty far away at that. I will not attempt to answer my rhetorical questions except to say that photography has added an important dimension to my appreciation of birds and nature. For one thing, it has allowed me to start my life list of bird sightings all over. I don't tabulate them or keep a spreadsheet, but I copy them into a set on FLICKR. My "Life List of Bird Photos" contains 261 images, including some omissions and some duplicates that I must weed out. Many of the images are poor, and I plan to replace them with better shots if I get them and remember to go back to the photo set. It is less than half way to the total on my ABA area list of species sighted. Of course it sets out an impossible challenge, as I am running out of time to try to match both lists. But the quest goes on, to find new species to add. 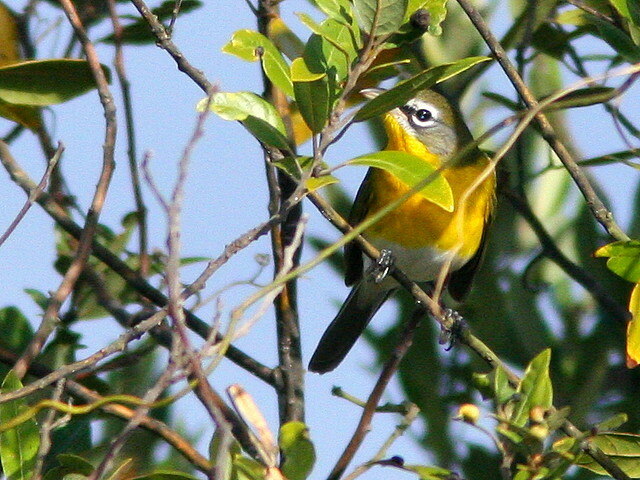 As I write this, I realize I have omitted this Yellow-breasted Chat. Binoculars can somewhat compensate for back-lighting that causes my camera to produce monochromatic silhouettes. With binoculars it is possible to piece together momentary glimpses of a bird as moves through the branches. On the other hand, photos sometimes reveal details missed in the real-time sighting. More than once, I found a "new" species after I looked at the photos back home. That is what happened when I took the above photo of the chat. I heard a strange call in the dense shrubbery, but all I saw was a Prairie Warbler. Only after I got home did I find that one of my shots of a partially obscured yellow blob actually revealed the chat. (Click on photos for more details and additional views). My first "real" sightings are seared into memory. As a kid, I did not need binoculars to witness the courtship of a pair of Rose-breasted Grosbeaks. From the seclusion of a thicket, I watched the male display on the ground in an open area, singing all the while. And so on-- my first Common Redpolls, Red-headed Woodpeckers, Peregrine Falcons ("Duck Hawks")... Now, I have a second chance to experience the thrill of "discovering" an old friend, and a few of my new species have been simultaneous additions to both the sightings and the photo lists. 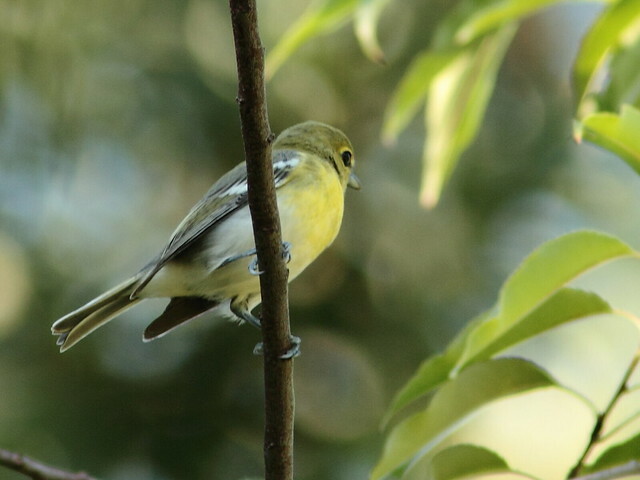 My most recent new "Life Bird Photographed" was this Yellow-throated Vireo, seen only a few days ago. 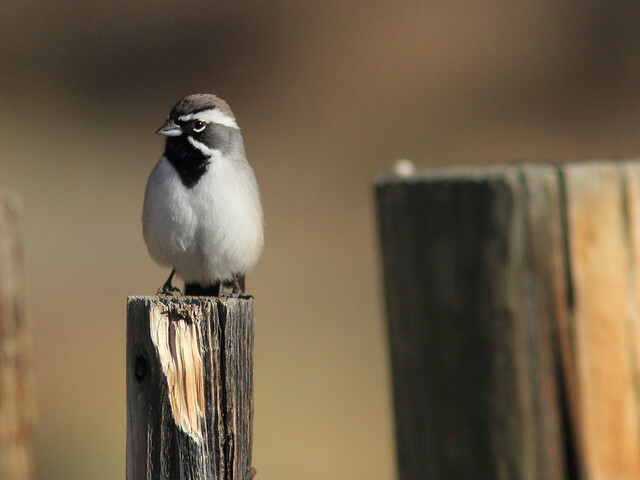 ...and on the same day nearby, a Black-throated Sparrow. 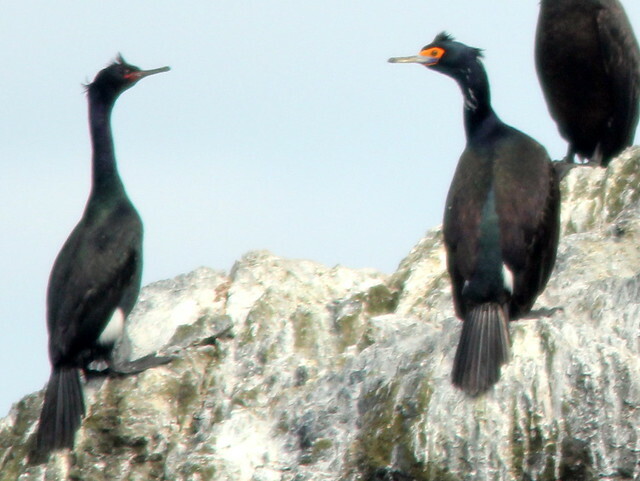 A spring visit to Alaska in 2011 added 16 newly photographed birds, but only one was also a true "lifer," this Red-faced Cormorant on Katchimak Bay. 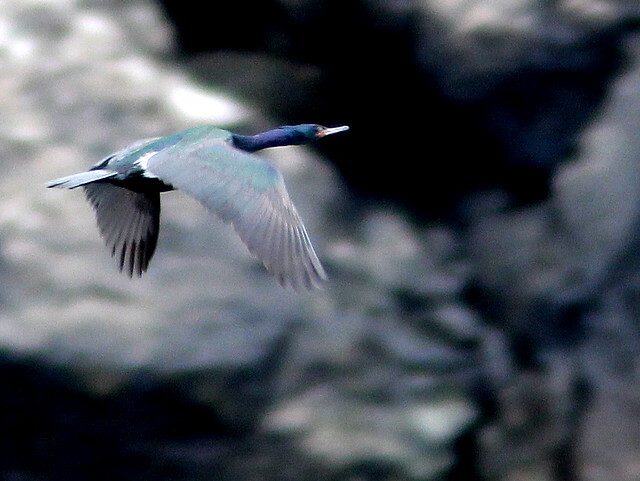 I had seen Pelagic Cormorants before, but this one was special because it provided my first image of this species. 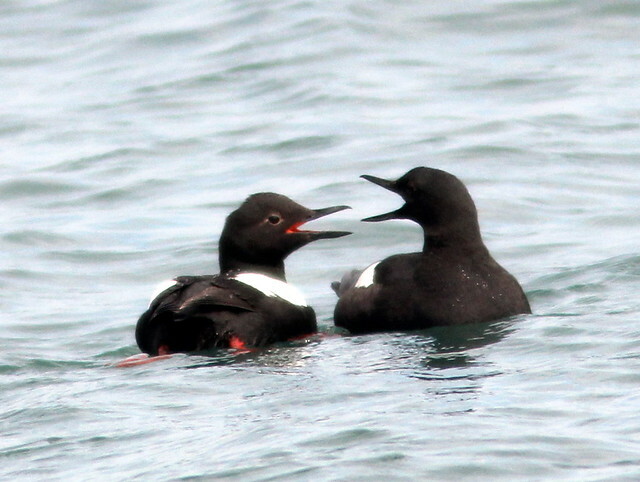 Pigeon Guillemots seemed to be engaged in friendly banter on Gull Island in Katchimak Bay. 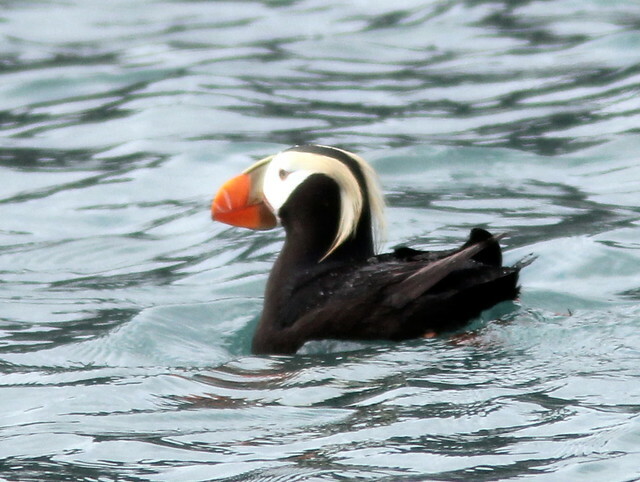 Though I had seen both common puffin species previously, I was able to get my first photos of a Tufted Puffin on Gull Island. 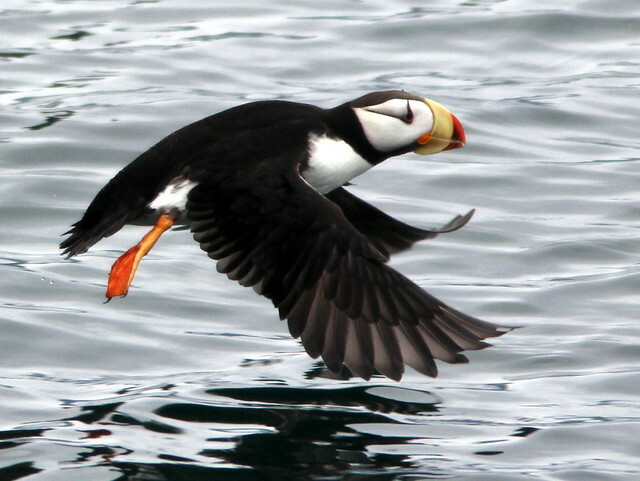 A Horned Puffin splattered across the bow of our sightseeing boat on Resurrection Bay, out of Seward. 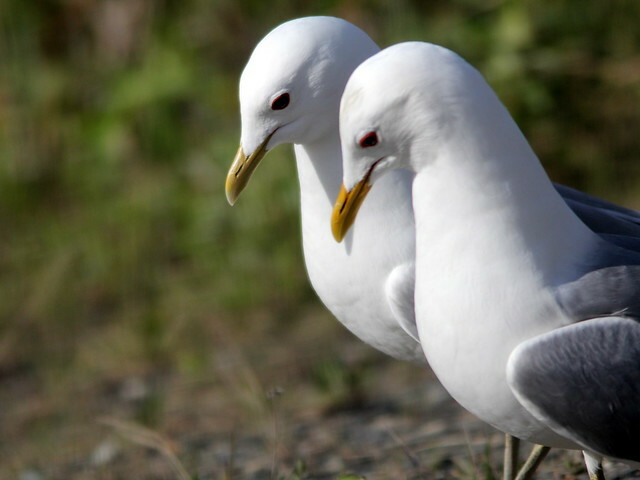 This pair of courting Mew Gulls in Denali National Park, shot through the side window of a bus, was one of my favorite new additions to the list. 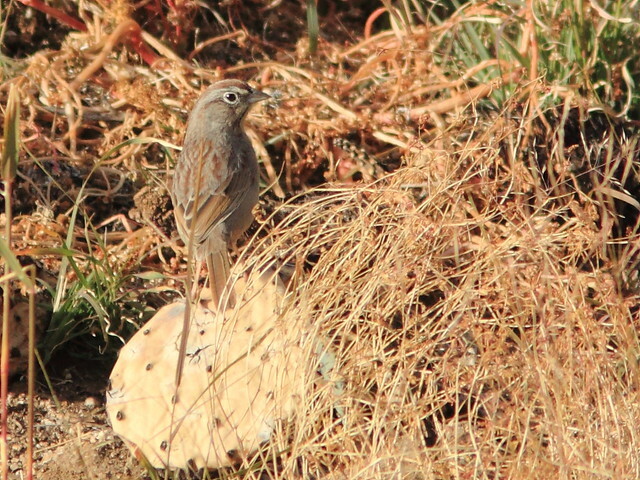 One of the earliest entries on my life list of photographed birds antedates my first DSLR. It is a "two-for" taken from behind the window of our former home in New Mexico with a 2 megapixel point-and-shoot through my Kowa scope-- a Pinyon Jay and a Western Scrub-Jay. Great post and marvelous images, Ken. For me, too, I only "own' the bird when I've got a photo of it. Looking at those photos, which I archive on my website, makes me relive the moments and preserves them for the future. Very nice post and pictures Ken. I have started doing a similar thing with photos, just not as formal yet. ONe of those projects I plan to sort through soon. As a bird photographer I only count birds if I get an image of them, I don't keep a list, just the files. If they are only documentary shots and poor quality they don't go on my site. But, I revel in the new birds I don't get images of too because for me it isn't just about photography it is also about celebrating nature. Well said Ken, you've expressed the pleasures of many the bird watcher and photographer. It has been a pleasure this year to see my photographed species list catch up to my regular lifer list, and then be able to relive the sightings and share them with others. I agree with Mia Ken. My life list is my image files. I like to be able to remember the time, place and circumstance I created the image. So I get more bang for my buck, looking at the beauty of nature and remembering how I got there! I really enjoyed this post Ken and it motivates me to do something. For the last couple of years I have been taking lots of pictures of birds, but I've barely organized them and it's to the point now that I don't even know what I have. I figure I should organize them now and create a folder for each species and organize them by taxonomy or something. Then I can start my birds photographed life list. Wonderful post! Terrific photographs! Surprisingly, my photographed list is just about even with my life list. I really love to look over old bird photographs, it brings me right back into the experience where I took the original shot.